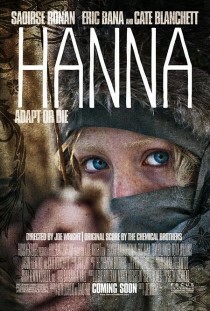 Hanna is a first-rate action thriller which centers around a teenage girl who has grown up in the remote wilds of Finland. Trained as an assassin from an early age by her ex-CIA father, she has been prepared for something. One moment a fierce adult, the next an innocent child, Hanna is a well-written character played superbly by seventeen-year-old Irish actress Saoirse Ronan. With this film, Ronan builds on her successful roles in Atonement and The Lovely Bones. Propelled by a heart-pounding score by the Chemical Brothers, with an excellent supporting cast which includes Cate Blanchett and Eric Bana, this film is fast-paced and exciting. You can find more information on this European-American movie on Wikipedia and IMDb. Ignore the IMDb user rating; this film is great. I was very surprised by Hanna. I really liked it. Good post. Hanna is definitely action packed. I loved Saoirse Ronan. She presented a youthful innocence a deadly character. Great, thanks. Watched the trailer. Looks like my kind of movie. Will let you know what I think once I’ve watched it.